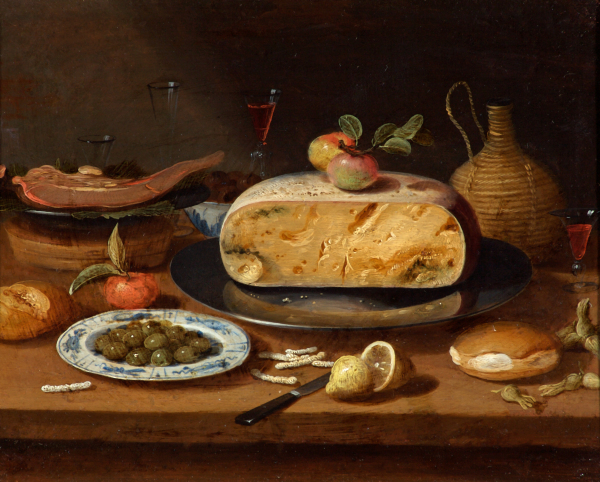 Still life painting, depicting everyday objects, flourished in the Netherlands in the seventeenth century. Small still lifes were often painted on recycled copper printing plates. This type of composition would have been described as a ‘little breakfast’, a selection of simple foods, such as bread and cheese, and plain tableware like the pewter plate and rush-covered carafe depicted here. The small white objects on the table are ragged comfits, a sugar-coated confectionery of nuts, seeds or strips of cinnamon.